In his first season with the Yankees, Michael King has ascended quickly through the system with consistently solid outings. Wednesday's start saw him reign supreme again. New York's No. 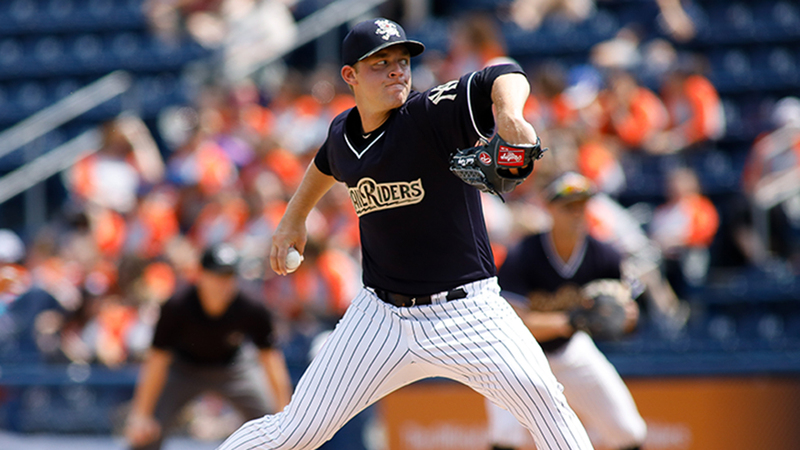 25 prospect hurled six perfect innings and fanned six as Triple-A Scranton/Wilkes-Barre walked off with a 2-1 win over Syracuse at PNC Field. "It's been fastball command in the past, but today was actually more off-speed pitches," King said. "We went to [the off-speed] early and it was working and we just kept doing it. I lost fastballs glove-side early and was kind of working fastballs in to righties and away to lefties. I would finish the lefties with changeups or righties with breaking balls. We just kept doing it the whole time." King was notably efficient on the mound by tossing 45 of 65 pitches for strikes against 18 total batters. He got into just two three-ball counts and set down eight Chiefs on three pitches or fewer. The right-hander forced weak contact throughout the outing, inducing eight groundouts to two flyouts -- the only two that reached the outfield while he was on the bump. His fastball with strong sinking action played into those results as Syracuse had issues trying to elevate the ball past the reach of the infield. "That's kind of my gameplan, the only time I go for a strikeout is when it's 0-2," King said. "I know I'm a sinkerballer and I'm just trying to get weak contact and go deep into games. And we were able to do that. ... It's definitely batter by batter. I like to critique myself and I know when I have [the sinker] and when I don't. Even when I do have it, I try to find things I can work on." With a seven-pitch sixth frame, King completed his 16th consecutive start of at least six innings. The 23-year-old did not complete at least five frames in a start on only one occasion this season -- three innings for Class A Advanced Tampa against Charlotte on April 27. Originally scheduled to only pitch five innings Wednesday, King finessed his way into working one extra stanza. At 155 1/3 total innings this year, the team didn't want to extend the hurler past the threshold they set for him. "I was fighting for [another inning]," the starter said. "I guess I earned the sixth inning. And I was hoping I could earn the seventh and it didn't happen. I was a little fired up, but it wasn't [pitching coach Tommy Phelps'] call, it was from higher-ups. They have a different reason and purpose, so I just have to do my own job and not think about that." Acquired from the Marlins this past offseason, King began the year in the Florida State League, sporting a 1.79 ERA despite a 1-3 record through seven starts for the Tarpons before his promotion to Double-A Trenton. In the competitive Eastern League, King held his ground, going 6-2 with a 2.09 ERA and a 0.95 WHIP in 12 outings (11 starts). Getting his first shot at Triple-A after he was moved up on Aug. 4, King has flourished in his first stint on the circuit with a 1.09 ERA and 27 strikeouts through 33 innings. The advanced scouting reports he's pored through since coming up to the International League have given him a chance to understand opponents' tendencies a little more. So far, he's reaped the benefits of the extra statistical analyses. "Especially when I don't have certain pitches and I know that they have a hole here and a hole here, and I know if I can't get it in one of those spots, I can expose them in a different spot," King said. "That's luckily what I've been able to do the whole year. And I get a lot more video and scouting reports based on spray charts and heat maps. It's been an easy transition because of that. I always say if you execute a pitch, you're going to get the hitter out -- more than likely." With the results he's had at all three levels, King has made the jump to a new organization look seamless. Changing uniforms was one thing, but bouncing to various leagues through the year was another. The Boston College product spent his first full professional season in 2017 with Class A Greensboro, so to be on the move this year in the Yankees system has been quite different. "It was a little change for me because I've never moved up to a level without friends there," King said. "It's been very easy with the coaching staff, coordinators and the players. They've accepted it and we're just going out there and trying to go out and win as many games as we can as a team." The Chiefs rallied off reliever Luis Cessa in the seventh as No. 26 Nationals prospect Jose Marmolejos plated MLB.com's No. 5 overall prospect Victor Robles with an RBI single. But in the ninth, the RailRiders rallied for the victory when Ryan McBroom drew a bases-loaded walk to end the night.